(CNN) -- Denis Menchov survived a dramatic high-speed crash in the final kilometer of the closing individual time trial stage to win the centenary edition of the Giro d'Italia in Rome on Sunday. 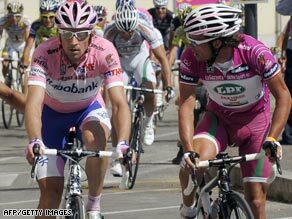 Denis Menchov (left) and Danilo Di Luca (right) battled to the last in the Giro. The Russian was protecting a 20 second lead over home hope Danilo Di Luca on a twisting and treacherous 14.4 kilometers against the clock in the Italian capital. After an initial scare as Di Luca powered to the fastest time at the first checkpoint, Rabobank rider Menchov appeared to be riding to a comfortable win. But over wet cobbles he slid off with his time trial bike careering up the road. Only quick work by helpers in his team car behind saved the day for Menchov who was able to remount and cross the line battered and bruised in 10th on the stage. It left him with a 41 second advantage over Di Luca, one of the closest finishes in Giro history. Franco Pellizzoti rounded off the podium finishers while Lance Armstrong took no chances in the conditions and remained in 12th place overall. Armstong was using the Giro as preparation for his bid to win his eighth Tour de France on his comeback to cycling. Lithuanian Ignatas Konovalovas of the Cervelo team won the final stage in a time of 18 minutes 42 seconds. Garmin rider Bradley Wiggins of Britain was unlucky not to claim victory as he finished just a second behind after being held up by a rider who crashed in front of him. Norway's Edvald Boasson Hagen of Team Columbia finished third, but the spotlight fell on Menchov and Di Luca who had battled throughout the closing stages for the coveted Maglia Rosa. Menchov may well have taken the stage honors but for his horror fall, but it mattered little as he crossed the line in triumph, quickly jumping off his bike and running to supporters.